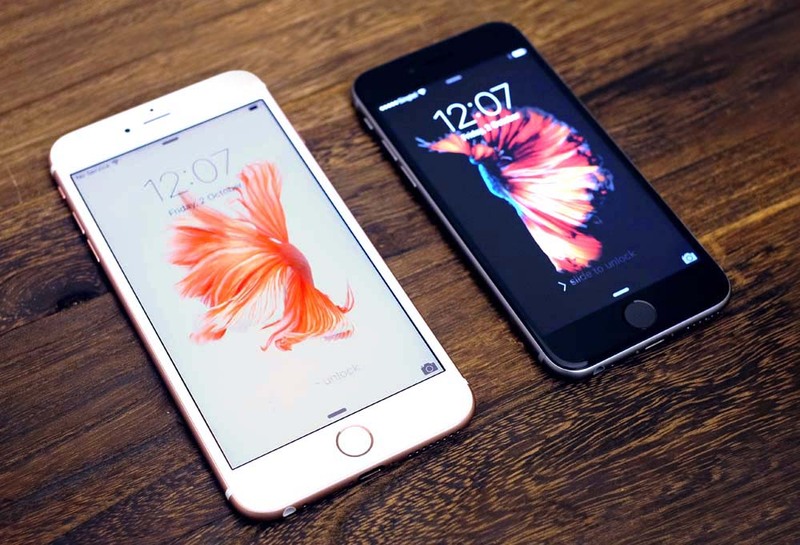 “The only thing that’s changed is everything” reads the slogan for the iPhone 6s and iPhone 6s Plus. It's a tongue-in-cheek reference to the perception that Apple's 's' models aren't particularly exciting. And yes, it's true that the 's' models generally look the same as their predecessors, but Apple's strategy actually makes a lot of sense. First Apple changes the external design, while evolving the internal components from the previous year's model, then the year after, the 's' update comes along with the same design, but with sweeping changes to the internals. 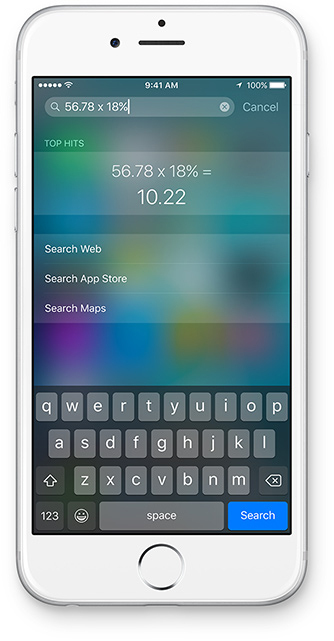 We saw this when Apple launched Siri with the 4s, Touch ID with the 5s, and now 3D Touch with the 6s. This cycle of upgrades allows Apple to focus on updating one half of the iPhone at a time, essentially giving the internal and external teams two years each to develop and perfect their next generation technologies. 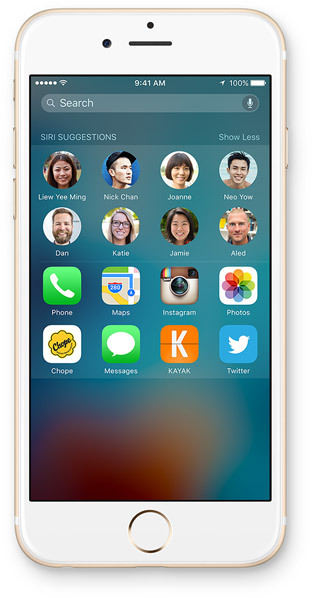 3D Touch isn't the only thing that's new in the 6s and 6s Plus. Apple has introduced a new 12-megapixel rear camera that supports 4K video (it's the first time in four years that Apple has bumped up the rear camera megapixel count),as well as a new 5-megapixel front camera, a much faster A9 processor, double the RAM, and an improved and more responsive Touch ID fingerprint scanner. These are not the same phones as last year. Look at the specs and you'll see that the new iPhones aren't actually completely identical to their predecessors. 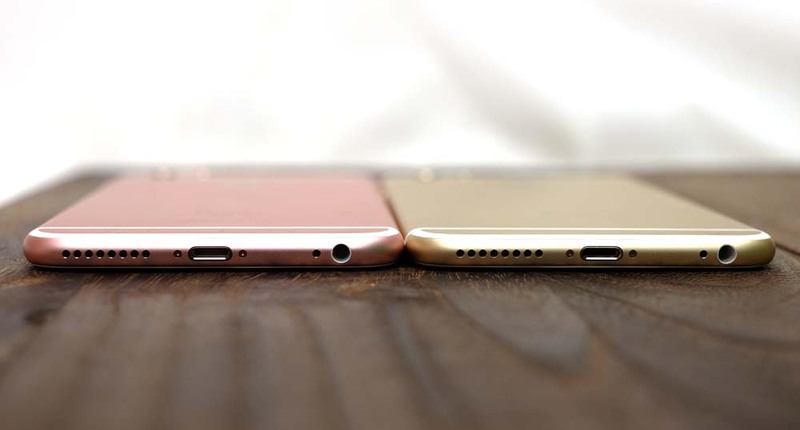 Both the iPhone 6s and 6s Plus are fractions of a millimeter wider, longer, and thicker than their iPhone 6 equivalents. Having said that, even with old and new phones side by side, stacked on top of each other, and scrutinized in detail, I couldn't tell the difference, and if you have a case made for the 6 or 6 Plus, it will fit the 6s and 6s Plus just fine. What is noticeable is the change in weight. Both of the new iPhones are heavier than last year's models - due to the new 3D Touch sensors and the haptic feedback engine under the display - and while it's only 14g more for the 6s and 20g for the 6s Plus, you can definitely tell. Don't get me wrong, these aren't heavy phones by any measure, and you won't be able to tell without comparing old and new at the same time, but the extra weight is perceptible in a way the added dimensions aren't. The new iPhones are made from a stronger 7000-series aluminum - the same material Apple uses on the Apple Watch Sport. The new aluminum is tougher than last year, which should avoid a repeat of #bendgate, but is otherwise indistinguishable. The front of the phone is tougher too. The new glass covering the screen uses a dual-ion exchange process that makes it less prone to shattering if you drop it and it's also more resistant to scratches. Below the screen, the new iPhones are fitted with a second-generation Touch ID fingerprint scanner that is insanely fast. In fact, it's so fast I've had to re-train myself to use the power button rather than the home button if I just want to check for notifications on the lock screen or see what time it is. Otherwise, it's a race against the sensor to see if I can take my thumb off fast enough before it scans and unlocks my phone (spoiler alert: the phone always wins). The scanner isn't just faster either, it's more accurate and reliable too, except of course, when your finger is wet (pro-tip: add a wet fingerprint ID to overcome this issue). On the rear of the phone, you'll find the same unsightly (but necessary) plastic antenna bands and unfortunately, even though the camera module has been upgraded, it still protrudes slightly from the body. For the first time, you'll be able to get your iPhone in four colors: Space Gray, Silver, Gold, and the new Rose Gold, which is actually more of a metallic pink color. Honestly, I didn't think I would like the Rose Gold, but it looks much nicer in person than in pictures, and isn't nearly as girly as I thought it would be. The color is a beautiful, vibrant metallic pink. In fact, it's so nice, it makes the regular Gold look a bit washed out and dull in comparison. In terms of resolution and quality, the displays on the 6s and 6s Plus are identical to their predecessors - 1,334 x 750 pixels for the 6s (326ppi) and 1,920 x 1,080 pixels for the 6s Plus (401 ppi). On paper, the 6s' HD display is starting to look a bit dated compared to Apple's rivals who are moving to QHD displays and in the case of Sony, inexplicably, a 4K display. 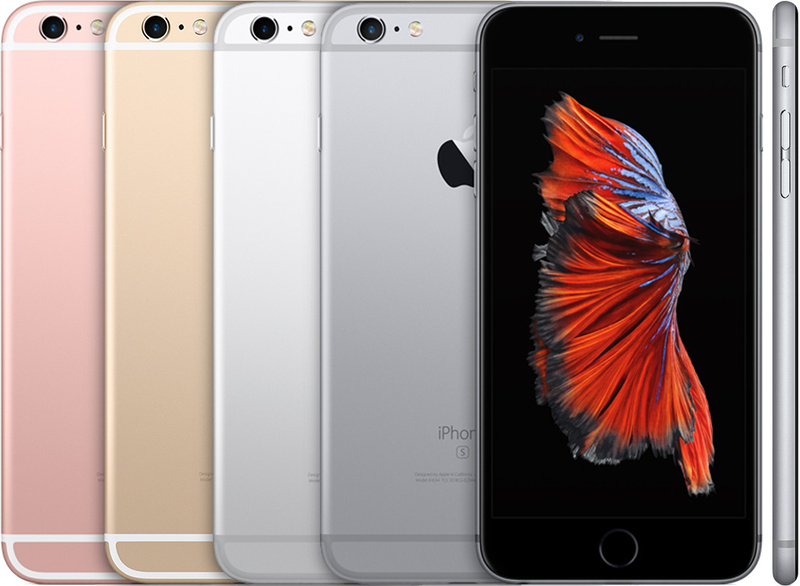 Having said that, the 6s and 6s Plus still look stunning with bright and accurate colors and great viewing angles. There's more than enough clarity here too and, unless you really scrutinize the screen, you won't notice much difference between the 6s and other higher resolution phones. But what really sets the 6s and 6s Plus displays apart from other phones is 3D Touch. 3D Touch is a feature you didn't know you needed until you actually start using it. Then you wonder how you ever lived without it. Similar to Force Touch on the new Macbook Pro's trackpad and on the Apple Watch (the actual technology used in 3D Touch is slightly different, thus the different name), 3D Touch lets the iPhone's display register varying levels of pressure. Where 3D Touch differs from Force Touch is that 3D Touch is much better integrated across iOS 9 than it is on Watch OS. On the Apple Watch the display is too small for touch interaction to be genuinely useful (which is why Force Touch on the Apple Watch is quite limited, and why it uses the digital crown or simple swipes for a lot of its interactions). But on the iPhone, 3D Touch is more like a right-click: a second way to interact with the display. You can use it to jump straight to your favorite features inside an app, or to preview web pages, messages, maps or images. 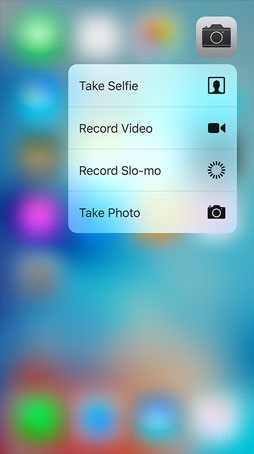 It's integrated into every part of iOS 9, so that whatever you're doing, 3D Touch can make it quicker and easier. On the homescreen, 3D Touch serves as a shortcut launcher. Press harder on an icon on the homescreen and a few shortcuts related to that app will pop up in a little menu - like taking a selfie with the camera, or calling one of your favorite contacts. Right now it's mostly just Apple apps that work, but some third party apps like Facebook have been updated as well (you can use it to jump straight to the status update page on Facebook). If an app doesn't support 3D Touch, you'll get a little vibration through the haptic feedback engine to tell you that nothing is going to happen. Where 3D Touch really comes into its own is when its used within an app. Here, Apple has given you two main features to play with: 'Peek' and 'Pop'. Yes, those are terrible names and bring to mind 1970's breakdancing but hear me out. 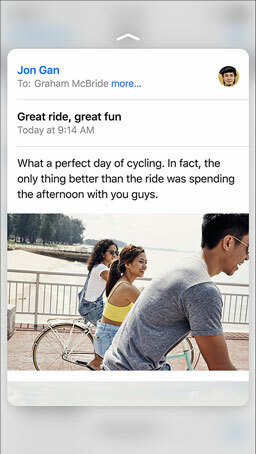 The basic idea is this: you can hard-press on an SMS message, an email in your inbox, an image you found in Safari, a website url your friend sent you or pretty much anything the iPhone recognizes as a link of some kind, and a preview window (a "peek") of the thing you pressed will appear on the display. From there, you can read the entire message, then simply lift your finger off to quickly dismiss it. 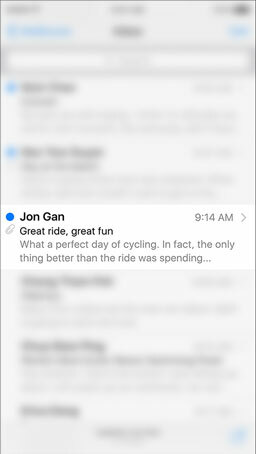 This makes it super easy and fast to scan through messages or emails without having to open each one individually. If you don't want to close the window you can press a bit harder to 'Pop' it, which launches the preview window into the relevant app for that content. There are other options in the 'Peek' view too. Slide your finger up and options will appear. For example in Safari, you'll be able to open the link, add it to your reading list for later, or copy the url. 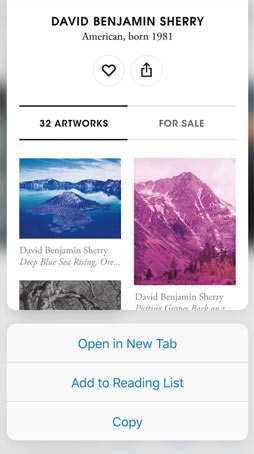 If you're viewing an image, you can save that image or open it up in Safari. In email, you can slide up for a bunch of options, or slide left to mark it read, or right to archive it. Oh and when you're typing an email, message, note or anything else that uses a keyboard? Hard press the on-screen keyboard and it will turn into a trackpad that you can use to quickly and accurately place the cursor where you want it. Let go of the screen and it turns back into a keyboard. Genius. 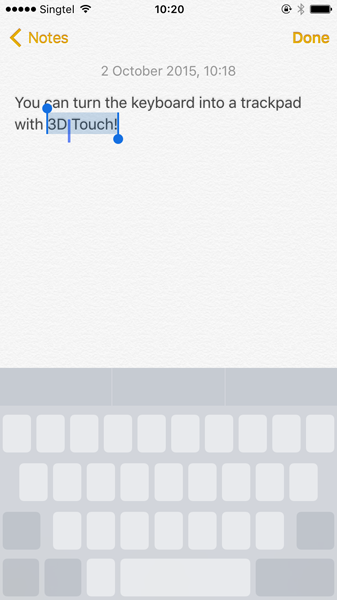 There are other things you can do with 3D Touch too. Apple has released the API to developers so anything that could be improved with the addition of pressure sensitive input (i.e. everything) will be able to take advantage of it. 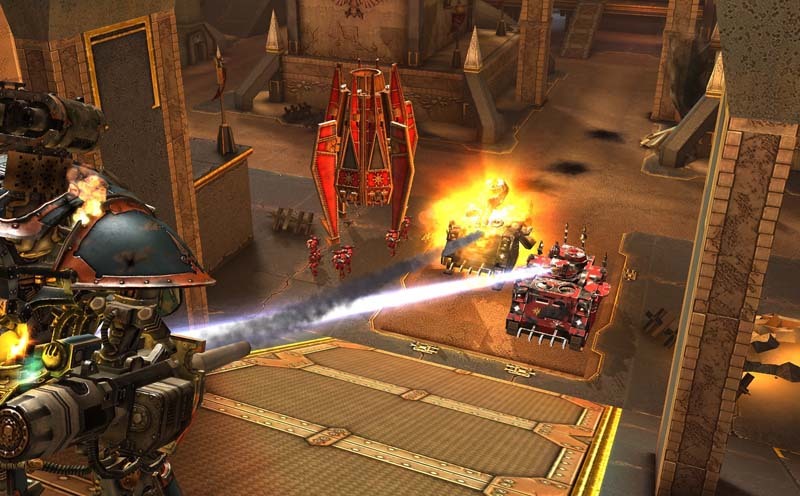 Personally, I'm looking forward to Pixel Toy's upcoming Warhammer 40k game, Freeblade, which will let you pilot a giant mech that shoots missiles out of its nose and has machine guns for hands (tap on the screen to fire the machine guns, or press harder to launch a nose missile). When Apple announced 3D Touch earlier this month, I fully expected to find it gimmicky and was prepared to ignore or disable it after a few days (sort of like Siri - sorry Siri) but to my surprise I find myself using it more and more. It takes a day or two to remember that its there and that you should use it, but 'peeking' and 'popping' soon becomes second nature and honestly, it's so well integrated and simple to use, I expect everyone who upgrades to the new iPhones to fully embrace it. 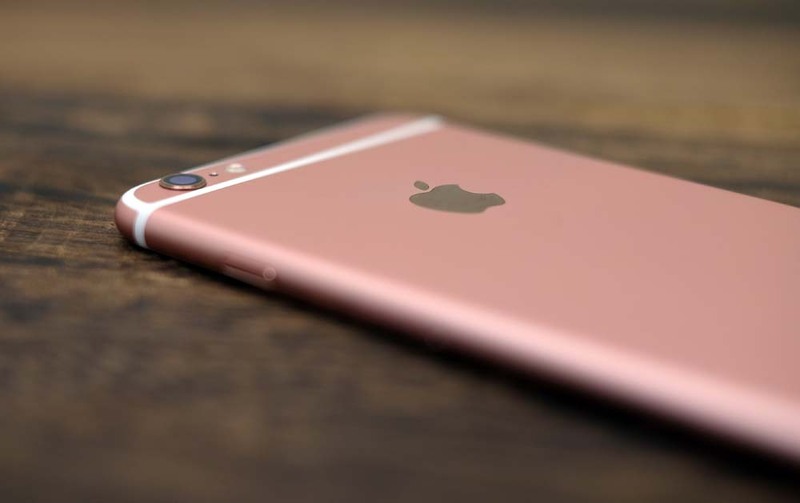 Apple always releases a new version of iOS for its new iPhones and the 6s and 6s Plus are no different. iOS 9 is more of a refinement of 8 rather than a total overhaul, with most of the upgrades focusing on improved performance and smarter interactions. For example, the Search screen is much smarter now. Swipe left from the home screen to access it and you'll see the familiar search bar and, below it, a new panel called 'Siri Suggestions'. Siri Suggestions fills up with contacts and apps that Siri thinks you’re likely to use, based on context and your previous activity. For example, if you always check Facebook as soon as you wake up, the Facebook app will show up on the Search screen first thing in the morning. If you always call your girlfriend in the evening, you’ll see her contact appear there once the time comes. Notes has been revamped in iOS 9 and deserves a special mention on the iPhone 6s and 6s Plus thanks to its interaction with 3D Touch. The new Notes lets you format your text, add photos, either through the dedicated camera button or just by inserting an image, add maps and URLs, create to-do-lists and best of all, you can use it as a sketch pad. Tap the sketch button at the bottom of the screen to begin drawing. This brings up a series of digital drawing tools (pen, highlighter, pencil and eraser), along with a ruler for drawing straight lines. Use two fingers to turn the ruler to any angle you want. 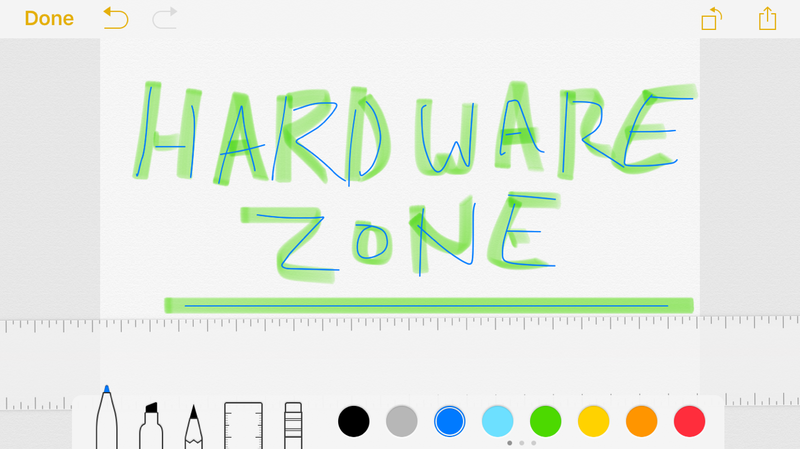 Turn the iPhone to landscape mode and you'll see a range of color options when drawing. The harder you press with your finger, the thicker the lines you draw. For a full overview of iOS 9, check out our coverage article from WWDC 2015, as well as this list of 9 things you should try in iOS 9.